Roughly the same size as California, Japan shares the Golden State's precarious plate tectonics. The nation's four main islands get hit regularly with earthquakes of varying strength. But while California has about 36 million people, Japan's population is nearly 4.5 times as large, and most Japanese live in extraordinarily dense cities. That puts more people squarely in a danger zone  nowhere more so than in the capital of Tokyo, which has a population of 13 million. 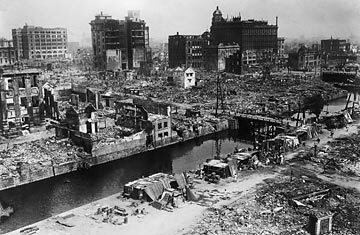 A major quake struck the city and its surroundings in 1923, killing as many as 150,000 people. Although Japan has vastly improved its infrastructure since then and has the strictest building codes in the world, a similar temblor  which seismologists believe is almost inevitable  could kill more than 10,000 people and cause more than $1 trillion in damages. Read "Japan Debates Safety After Quake." See TIME's 1995 cover on Japan's quake.